As science enthusiasts around the world bid farewell to legendary cosmologist Stephen Hawking, researchers continue to make important discoveries about the evolution of galaxy clusters that capture the imagination. Now, an international collaboration between Yutaka Fujita at Osaka University and researchers from Taiwan, Italy, Japan, and the United States found a new fundamental law that stipulates the evolution of galaxy clusters. They recently reported the study in The Astrophysical Journal. Galaxy clusters are the largest celestial body in the Universe (Fig.1). However, it has been difficult to measure their size and mass accurately because they mainly consist of dark matter that we cannot observe directly. One way to observe the dark matter indirectly is to use the gravitational lensing effect based on Einstein's theory of relativity. Light rays from a galaxy behind a cluster are pulled by the gravity of the cluster as they pass through it, and their paths are bent (Fig.2). This is exactly the same effect as a lens, focusing the light of the distant galaxy and distorting its shape. If we can measure the distortion of the shape for many background galaxies, we can reveal the gravitational field of the cluster, and as a result, we can accurately measure its size and mass. "One difficulty in our research," explains Keiichi Umetsu at Academia Sinica in Taiwan, "was that accurate measurements of the distortion were necessary." To overcome this problem, the research team has used precise observational data from NASA's Hubble Space Telescope and the Subaru Telescope operated by the National Astronomical Observatory of Japan. Combining with gas temperature data from the Chandra X-ray satellite, the research group statistically examined those latest data and found that they conform to a simple law represented only by the size, mass, and gas temperature of clusters. Moreover, by making full use of computer simulations, they showed that clusters have grown over 4 to 8 billion years according to the law. Theoretically, the law means that those gigantic clusters are still in adolescence, growing by drawing a large amount of surrounding substances with their strong gravity (Fig.3). "We’ve discovered the law that regulates the growth of clusters of galaxies," Fujita says. "Clusters have an internal structure uniquely created in an early growth spurt." The law is so simple that we can use it to calibrate cluster mass-observable relations, which are a key ingredient for studying the cosmological laws of the Universe. "Our research draws us closer to explaining the evolutionary history of clusters and the Universe," Fujita adds. Fig. 1. 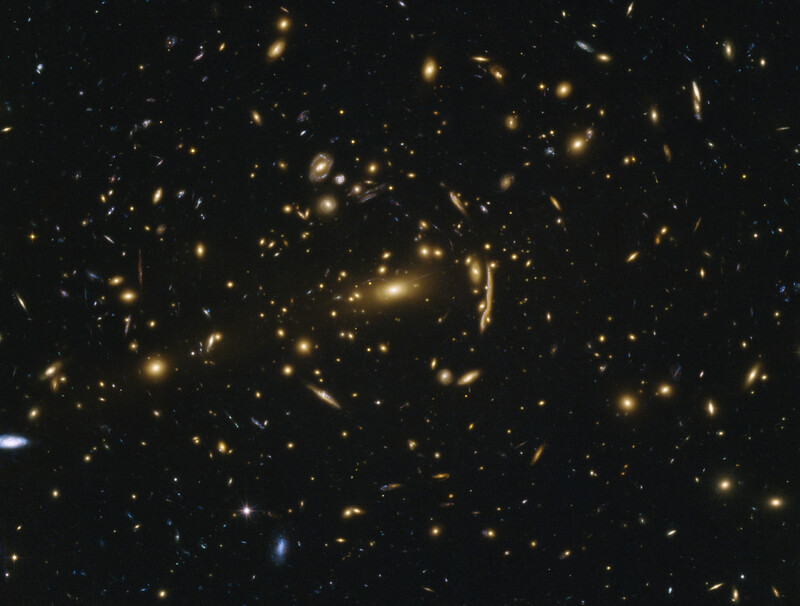 (Left) Galaxy cluster MACS J1206 observed with the Subaru Telescope. (Right) Magnified image of the left by the Hubble Space Telescope. Fig. 2. Schematic figure of gravitational lensing. Light rays from a background galaxy are bent by the gravity of a galaxy cluster. Fig. 3. (Left) Growing cluster attracting many galaxies and dark matter. Galaxies are rapidly falling and gas temperature tends to rise. The new law indicates that the clusters are in this state. (Right) Matured cluster in a calm state, attracting little material.